This monument credits James Esmond with the earliest media announcement of payable gold in Victoria. Obelisk is of sandstone blocks on a granite base. Gold was discovered near Clunes but kept quiet by squatters for fear of rushes onto their properties, and it was discovered before it had been discovered at Warrandyte. In July 1851, James Esmond, who had been to the goldfields of California, came to Clunes and mined some samples from the quartz, then journeyed to Geelong to report the discovery. He reached Geelong on Saturday, 5th July 1851 where his report was received with great enthusiasm. 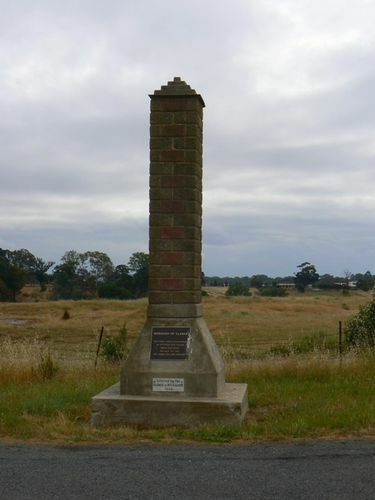 A meeting was held in the Town Hall on Friday evening in connection with the proposed memorial in honor of the first gold discovery in Victoria at Clunes. The Mayor (Cr J. F. Phillips) occupied the chair, and Mr W. Smithers Gadd, secretary of the Early Colonists' Association was present and addressed the meeting. It was decided to inaugurate a fund for the erection of a memorial. Those present formed themselves into a committee to arrange details. The Mayor was elected president. Cr W. Turnbull vice president, and Mr H. F. Sando, secretary and treasurer. A subscription list was opened and several funds were donated including £1 from Mrs Bunt of Melbourne, a former resident of the town. The Mayor also donated £1. The Ballarat Courier, 19 January 1914.